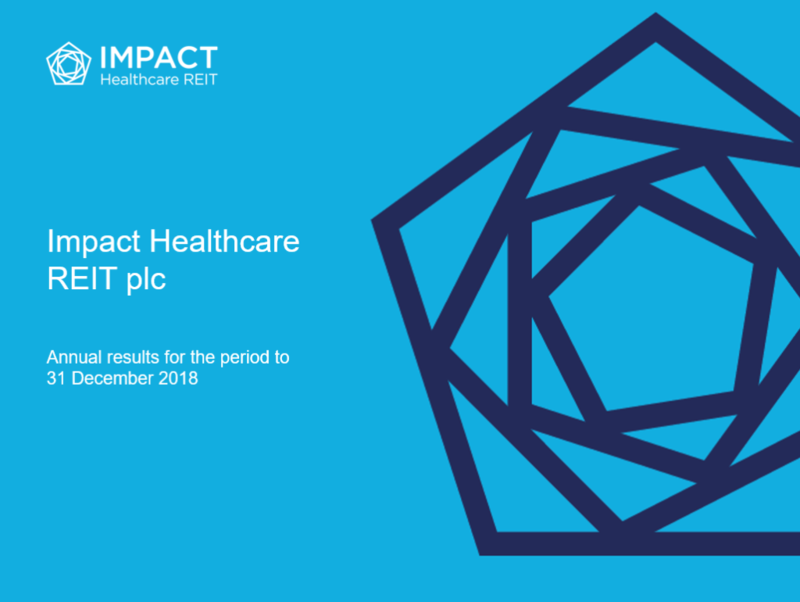 Impact Healthcare REIT plc (“we”, “our” or “Impact”) is committed to protecting the privacy of third parties (including its investors and all visitors to the website www.impactreit.uk (the “Website”)). Please read the following Privacy and Cookies Policy which explains how we use and protect your information. We will only use information from which you can be identified (“Personal Information”) provided to us, or otherwise obtained by us, as set out in this Policy. We endeavour to ensure that your Personal Information is handled in accordance with “Data Protection Legislation”. References to “Data Protection Legislation” in this Policy mean any law applicable from time to time relating to the processing of personal data and/or privacy, as in force at the date of this Agreement or as re-enacted, applied, amended, superseded, repealed or consolidated, including without limitation, the UK Data Protection Act 1998, the General Data Protection Regulation (EU) 2016/679, and the Privacy and Electronic Communications (EC Directive) Regulations 2003, in each case including any legally binding regulations, direction and orders issued from time to time under or in connection with any such law. By visiting and/or contacting us through the Website (or otherwise engaging with us), you acknowledge that we may collect, use and transfer your Personal Information as set out in this Policy. Impact reserves the right to change this Policy from time to time and you should therefore check this page frequently to ensure that you are happy with any changes. 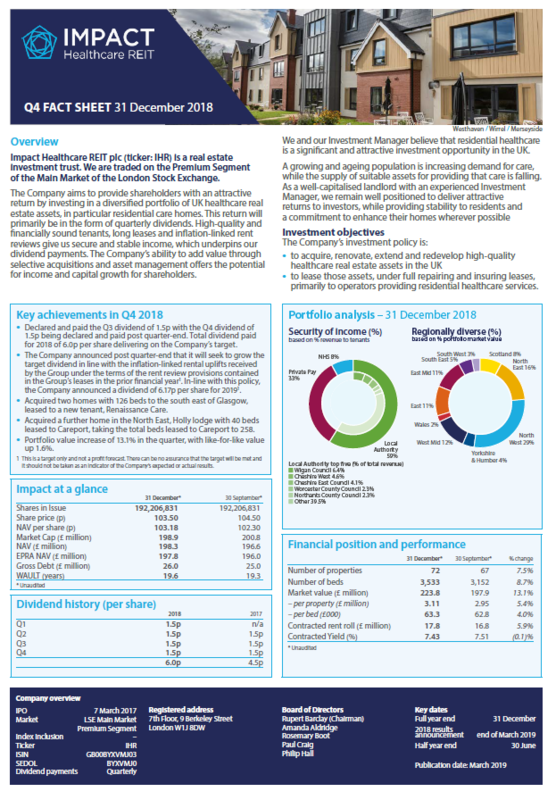 In this Policy, “Impact”, “we”, “us” and “our”, refer to Impact Healthcare REIT plc, registered in England and Wales with registered office 7th Floor, 9 Berkeley Street, London W1J 8DW. Our company registration number is 10464966. For the purposes of Data Protection Legislation, we are deemed to be the “data controller” in respect of any Personal Information that you provide to us or we otherwise obtain about you. (d) for our internal business processes. In addition, it may be necessary to disclose your Personal Information if we are under a duty to disclose your Personal Information in order to comply with any legal obligation (such as AML obligations), or protect the rights of Impact, Impact’s directors, employees or other personnel. This includes exchanging information with other companies and organisations for the purposes of fraud protection and prevention. The Personal Information you provide to us will be transferred to and stored on our servers in [insert country where such servers will be hosted. Nb please contact Aaron Stocks if the servers are located outside the EEA] and we take steps to protect your Personal Information from unauthorised access and against unlawful processing, accidental loss, destruction and damage. In processing your Personal Information, it may be necessary for us to transfer your Personal Information outside the European Economic Area (“EEA”). It may also be accessed by staff operating outside the EEA who work for us or for one of our suppliers. This includes staff engaged in, among other things, the provision of support services to the Fund or the Website. We will take all steps reasonably necessary to ensure that your Personal Information is treated securely and in accordance with this Policy and Data Protection Legislation when it is processed in, or otherwise accessed from, a location outside the EEA. This means that we will only transfer your Personal Information to third parties outside the EEA if that third party (a) is situated in a country that has been confirmed by the European Commission to provide adequate protection to Personal Information, or (b) has agreed (by way of written contract) to provide all protections to your Personal Information as required by Data Protection Legislation. For the avoidance of doubt, in the event that the UK is no longer a part of the EEA, references in this paragraph to the EEA shall mean the EEA and/or the UK. (c) transfer any information we hold about you to a specified third party. If you wish to do this, please contact us using the contact details set out at section 10 below. Should you have any queries or complaints in relation to how we use your Personal Information, please contact us using the details set out at section 10 below. Should you wish to take any complaints or queries further, you have the right to contact the Information Commissioner’s Office regarding such issues. (a) Strictly necessary cookies. These are cookies that are required for the operation of our Website. (b) Analytical/performance cookies. These cookies collect information about how visitors use our Website, for instance which pages visitors go to most often, and if they get error messages from web pages. Information collected by these cookies is aggregated and therefore anonymous. It is only used to improve how the Website works. (c) Functionality cookies. These cookies are set by 3rd party services such as Investis Limited. Investis provide the share price and RNS feed. We use Google Analytics on our website to collect information about visitor behaviour. We use this information to review the performance of the website and inform any decisions we make on future developments. Impact may amend this Policy at any time without notice. By continuing to use the Website and making use of our services you agree to the updated Policy. If you do not agree to any changes that we make, you should not use or access (or continue to use or access) the Website and/or our services. Any changes to this Policy will be posted on the Website. 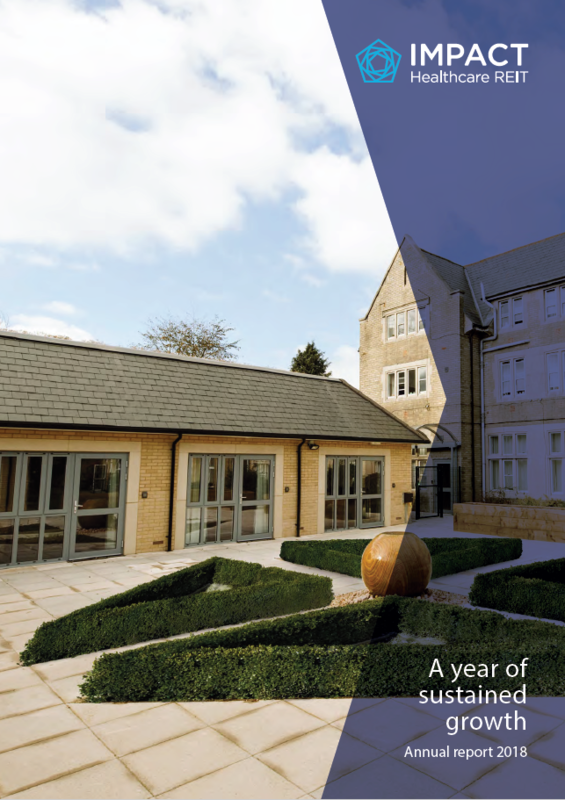 Alternatively, you may call our team on +44 (0) 203 146 7100, Monday to Friday: 9am to 5pm.